Sublette School District Map SCSD#9 School District Map, modified by Pinedale Online (to add in town labels and explanatory text.) See Related Links below for original map (PDF). Two meetings will be held to discuss the parity and community impacts of the school district tax monies for BOCES and recreation. Sublette County School District #9 (Big Piney, Marbleton, LaBarge) has asked Sublette County School District #1 (Pinedale, Boulder, Daniel, Cora, Bondurant) to redistribute a share of their tax revenue to equalize the per student funding ratio. 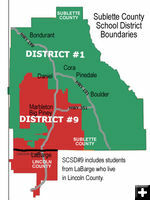 There will also be a discussion about the school district boundary lines. Interested public is invited and encouraged to attend these meetings to hear the issues and offer their input. Changes in funding will impact facilities, services, staffing and programs currently available in both school districts. State statute requires both school boards to agree to any boundary change that would resolve the disparity. Tuesday, March 22, Pinedale Auditorium, 7:00PM: Community Impact meeting. On proposal by Sublette County School District #9 to SCSD #1 asking to redistribute a share of the BOCES and Recreation school district tax monies. Wednesday, March 23, Marbleton Senior Center, 7:00PM: School District Informational Q&A meeting in Marbleton regarding Sublette County School District boundaries for #9 and #1 and tax parity between them for BOCES and recreation tax revenue. Public invited and encouraged to attend.